I had been lying on the bed for nine and a half hours when I woke up, and had little inclination to spend another moment there. I couldn’t remember the last time that I had spent that long in bed. Downstairs there was no sign of life, but a pot of fresh coffee was steaming on the sideboard in the room where the tables were laid for breakfast. I helped myself to a cup and sat deferentially in the corner, so as not to upset the more illustrious guests. A cheery Bob soon appeared and ran through the breakfast options with me. My food had arrived by the time the other guests appeared. They were a middle-aged couple, who were undoubtedly moneyed but not famous outside their own home. Although he was very courteous to them, Bob didn’t offer them any special treatment. They were German, and in fact were only offered the choice between pancakes and scrambled egg. I’d been given the choice of French toast as well. It was 9.30 by the time I drove away into to the green yonder. I’d read about a couple of small villages that I wished to see before I headed off for New Hampshire. I had originally intended staying in one of them, but had decided that they would be too quiet. I wanted to see if they could have outdone the roller-coaster experience of staying at the Foxfire. The first was Craftsbury Common, and the sort of place that I’d only seen before in tourism brochures and picture postcards. Twee as an adjective doesn’t get near expressing the full extent of tweeness that was to be found there. I didn’t think that places like this were for real. The common itself was surrounded by trees in the full flush of Fall. A gravel lane ran round its perimeter, giving access to a number of large white houses all painted identically with dark green shutters. Nobody was around. The only person I saw was a teenage girl who visited the post office before sloping back to a building that I assumed was the local school. I drove off in the direction of Craftsbury village, where I found a pay phone. It was time to call Watch Hill once more. It was 11.05, but the bookings person wasn’t in yet. Ring back in half an hour. The village of Greensboro was a few miles further down the lane, and was in similar vein to Craftsbury. I went into Willey’s General Store, which was as old fashioned as they come. It felt like something from the Norfolk Broads back in the fifties or sixties. There was no obvious system to the layout, just numerous aisles with shelves full of random everything. I bought a paper and some more Scotch tape. The road out of Vermont towards St Johnsbury was glorious. The trees were a kaleidoscope of reds and yellows, and small brooks ran hither and thither. The weather that day was due to be mild with the possibility of showers later. There might even be snow flurries this weekend. I knew this because I had listened attentively to the forecast given by Star 92.9 radio’s implausibly named weatherman, Randy Mann. No doubt he’d had fun introducing himself to prospective dates as a teenager (not to mention their parents). 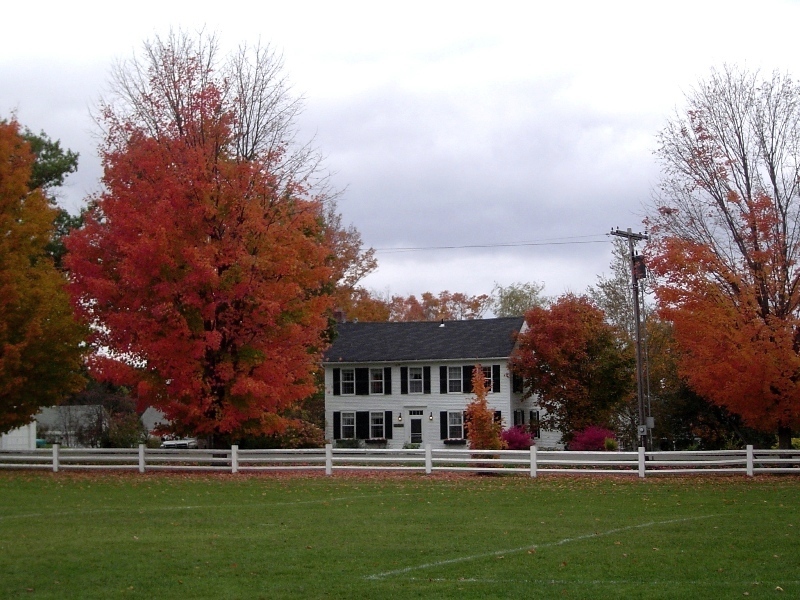 New Hampshire was distinctive, certainly for an east coast state. Not only did it have a speed limit of 65 mph on main highways, it was the only state in the Union in which seat belts were not compulsory (although occasional signs did urge under 18s to buckle up on the basis that “you know it makes sense”). It was also one of only four states in which auto liability insurance was not mandatory. The whole attitude was summed up in the state’s official motto, “Live free or die”, which they happily emblazoned on their license plates. I also spotted some signs with the warning “Brake for Moose, it could save your life.” Apparently, somewhere in the region of 200 people a year are killed by hitting moose with their cars. The beasts weigh up to 1600 pounds each. You wouldn’t want one careering through your windscreen at 50 mph. The emblem on the state license plates was the Old Man of the Mountains, and my guidebook told me that this rock formation was visible from the highway on which I now found myself. Directions to a viewing point led to a car park where there were eight or nine other vehicles. Everyone was walking out on to a bridge and taking photographs to their right, and so I followed. I looked up at a magnificent mountain bedecked with all the colors of fall. I stared and stared, but couldn’t see anything of note. The guidebook had warned that it looked quite small from the ground, so I thought I might be looking at the wrong spot. I asked the person next to me where the Old Man of the Mountain was, and he told me that I needed to go down to the next exit on the Interstate. I was thankful that I had phrased the question in such a way that my idiocy of being in completely the wrong place had not become public. 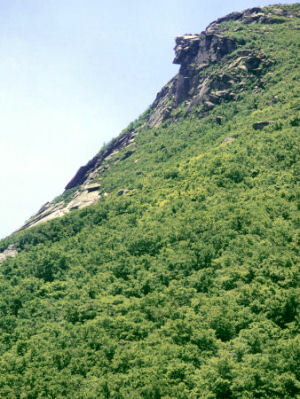 I was also quite thankful that the person I had asked knew what was meant by “the Old Man of the Mountain”. A couple of miles down the road, I found the right car park and walked the 600 yards to the foot of the monument. The guidebook wasn’t understating the fact when it described the stone face as looking small from the ground. Even standing in the right spot, it was barely noticeable. If it hadn’t been for the legion of camera lenses trained up at a ridge, I still wouldn’t have known where to look. 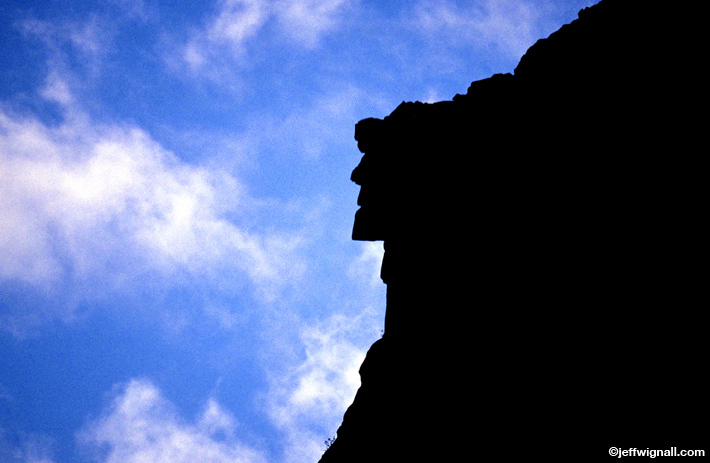 Way up high 1200 feet above me, formed from the weathered rocks, I finally saw the Old Man. It just about looked like a face, in the same way as the constellations in the sky look like crabs and rams. The time was right, so I stopped to call my friends at Watch Hill once more. Finally, I got through to someone who could answer my enquiry, and who told me that they did have a room on Sunday for $108. They also told me that the minimum stay was three nights. I explained that I would only be in town for the one night, which met with a firm reply. The minimum stay was three nights. Well thanks a bloody million. New Hampshire was a state that took its scenic routes seriously. The Kancamagus Pass was delicious. By the time I had reached Conway, I had already used up more than half a roll of film. The only other place where I had taken so many shots in such a short space had been Yellowstone National Park. It was rudely beautiful. Just beyond Crawford Notch, I stopped at Willey House. The place was named after a house built back in the 19th Century by the Willey family, much to the derision of the locals at the time. It was below a cliff that was renowned for falling boulders and the like. One day there was a massive landslide that wiped out everything in its path, but miraculously split as it reached the house leaving it untouched. Sadly, the whole family had perished when they scampered out the house and tried to make a run for it. I had no idea where to go next. Ironically, given that it was the mythical Fall, I felt that I’d arrived at the wrong time. These were tourist places, but the only folk on vacation in October in America were pensioners. The skiing season had yet to start, and everywhere decent cost a fortune and had been booked a year in advance. Thanks to sticking to the tourist areas, I still hadn’t seen any of the real New Hampshire where the normal people lived. I was quite close to Berlin, which looked like a large town and so I decided to go and have a look. It didn’t take me long to conclude that it wouldn’t be the best place to stay for the night. Juxtaposed against the wealth of the nearby ski areas, it was pretty run down and grubby. Even the main street felt more like an urban back street. I circled around and came back south to Gorham. I looked at my map. I was only a few miles from where I had entered the state from Vermont, and at the top of the road that led south back to Conway. On the way down the road, I passed a couple of attractions that were closed for the night but looked interesting possibilities for the next morning: the Mount Washington Auto Road (seemingly a route for driving at least part of the way up the mountain), and some gondolas that stretched up into the mountains with the intriguing name of Wild Cat. A worrying number of “no vacancy” signs greeted me as I passed various motels and B&Bs along the road. Only the dodgiest looking places seemed to have any space. It was getting dark, and I started to set my sights lower. I didn’t want to end up sleeping in the car that night. Up ahead I noticed a glow from a building. It was an Irish pub called Shannon Door and looked perfect, apart from the fact that it didn’t offer accommodation. This was the place that I wanted to come this evening. I resolved to find the nearest motel, however grubby. I pulled out of the car park and found myself opposite the Ellis River Hotel, complete with a “vacancies” sign. I slunk up the long driveway and parked. It was a cosy place with a swimming pool outside that, judging by the vapor coming off it, was heated. I went in and rang the bell. A young chap appeared, full of smiles and welcome. They had a room for $110. I winced, in the way that had worked so effectively in Eureka Springs AR. It didn’t work at all here. He explained that this was their busiest week and so they had to charge that amount. I told him that I’d go and see if I could find something more in my price bracket, and traipsed back out across the parking lot. I wasn’t half way back to my car when I owned up to myself that this was still my best bet. After all, who was I kidding? Did I want to save myself perhaps twenty bucks in order to have another miserable evening staring at the wall? I went back in and told him that I’d take the room after all. He laughed and showed me up to it. I asked about the bar across the road and he said that the food was basic but good and they had a live band playing there that evening. Two people were in the pool as I left for the pub. Either it must have been heated or they were clinically insane. It was not a warm evening. The pub was more spit and sawdust than it had looked from the outside, and I’d arrived at family meal-time. All the tables were packed with legion juveniles stuffing pizza into their faces. I took the one empty stool at the bar and ordered a beer. Like many of the places that I had been to, this was full of locals who were keeping themselves to themselves. I looked around, but there weren’t many conversations that I was likely to be able to break in to. All I got were a couple of filthy looks from a guy who thought I was eyeing up his food and another from a guy who thought I was eyeing up his woman. Regardless of the potential welcome or absence of it, I wasn’t best placed. I was on the corner of the bar with a pillar in front of me and so I couldn’t catch anyone’s eye naturally without craning round like an over-eager moron. A couple of girls came up to the bar and ordered drinks. One of the guys to my left started chatting them up. He knew a colleague of theirs, and had given him lessons on how to ski. After a few minutes of exchanging pleasantries, the two girls bade their leave and went back outside. The two guys joked about how much easier it was talking to women when you’ve got a girlfriend. The barman joined in. They all agreed that women had the uncanny knack of smelling desperation from miles away. It seemed an odd conversation for three guys in their forties to be having so publicly, but it at least suggested they were approachable. I took my chance and leant over to ask if they could tell me about skiing in New Hampshire. I think I asked how much a day would cost, but it didn’t really matter. I just wanted to have a chat with someone. Fortunately, men aren’t quite as good at smelling desperation from miles away. Whatever it was I asked, they were off and running. Homer and John were both technical directors of nearby resorts. Homer worked at Wild Cat and John at Cranmore. They got into such detail that they couldn’t help me any more, and gave me some numbers to ring to find out more information before returning to their conversation. My ploy had had no lasting effect, and I was back to lurking behind my pillar. Within a few minutes, Homer stood up and gulped down the last of his beer. He was off, but John appeared to be staying and was now in the same boat as me. We both looked into space for a short while and then John turned and continued the conversation about skiing. Within five minutes, he had pulled his stool up to my corner. Within an hour, we were buying each other beers. Within two and a half hours we were both rolling drunk and arranging a tentative house swap for a week. John had been to London and really liked it, and wanted to go over again with his girlfriend. He thought that the skiing in New Hampshire couldn’t touch that in the Alps, but it was still good stuff if you knew where to go and were a decent intermediate. He came from New Hampshire, and I told him where I had been and the difficulty that I’d had finding the real people from the state. He agreed and said that it was mainly folks “up from Mass” who frequented those parts. Apparently those from New York state ski in Vermont, and those from Massachusetts ski in New Hampshire. The locals knew them as Massholes. John was kind enough to point out the phonetic similarity to “assholes” for me. I hadn’t seen enough of the state to come up with any searching questions, so I asked him why the New Hampshire primary was always the first to declare. He didn’t know the answer, but reckoned it was something to do with being a small state and a keenness to retain some degree of national prominence. He advised me to do the Washington Auto Road the next day if it was a clear day. It would give me a much better view than the Wild Cat gondola, which was just a standard ski lift serving Homer’s resort. Just as the kitchen was closing, a couple presented themselves at the bar begging for pizza. The barman reluctantly agreed to take their order, and they fell in with our conversation. Their names were Rana and Vicky and they were over from London. The previous night they’d spent in Bar Harbor ME and had found it amazing. They’d also been to Camden, but told me that Bar Harbor was much better. I asked them if they had been at all worried flying in the current situation. They had been totally unfazed by it, and glad of the discounts that had made their vacation a possibility. They reckoned that now was the safest time to fly ever. John agreed and asserted that no American plane was ever going to be hijacked again. He reckoned that Americans would never again believe assurances from the cockpit if a plane were hijacked and would rush any terrorists and overpower them. They might as well, if they were going to die in any case. And, he pointed out, any aspiring hijacker knew that and would never risk it again. I went to the restroom, and when I got back there was another pint waiting for me. John had got them in on our behalf. After all, we were good mates now and were going to be exchanging houses for a week in February. By the time we all rolled out of the bar, the driveway back to the hotel seemed much longer than I had remembered it being on the way out.